Steam has been the de facto digital distribution platform on PC well over a decade, but with the pressure mounting from all sides, one could be forgiven for thinking that Valve might be feeling a little flustered. Although Valve described the Metro Exodus exclusivity as "unfair to Steam customers", it is not engaging too heavily in the narrative around a platform war with Epic Games. If Valve does feel threatened, it's certainly not on display. There was an expectation to see more from Valve during its Steam business update at GDC this year. Further complacency could well be its undoing, and while we're still a long way from that, it's a slow moving ship that has done little to change course. After going unchallenged for so many years, Steam has recently met vocal opposition to its content moderation policy, criticism over discoverability issues, and pressure to offer a cheaper distribution service to developers. In fact, a recent survey by GDC found that just 6% of developers feel Steam does enough to earn its revenue share. The Steam business update did little to address these issues, as it instead offered tweaks on the discoverability front, and more transparency into how Valve's revenue share has been spent. Valve's presentation showed off a few new features for developers and users alike, along with improvements and iterations made on existing features. "This network is truly built for gamers and game developers and it's vastly better than the open internet"
Perhaps the biggest announcement was that Steam's network is now available for all developers to use. The network has 125 relays and took years for the company to build, but promises a level of stability for online play that allegedly cannot be matched over the open internet. As Kassidy Gerber from the Steam business team said, this network allows the platform to move players from their ISP to the closet relay and route their traffic in "the most efficient way possible, no matter what's going on the internet." 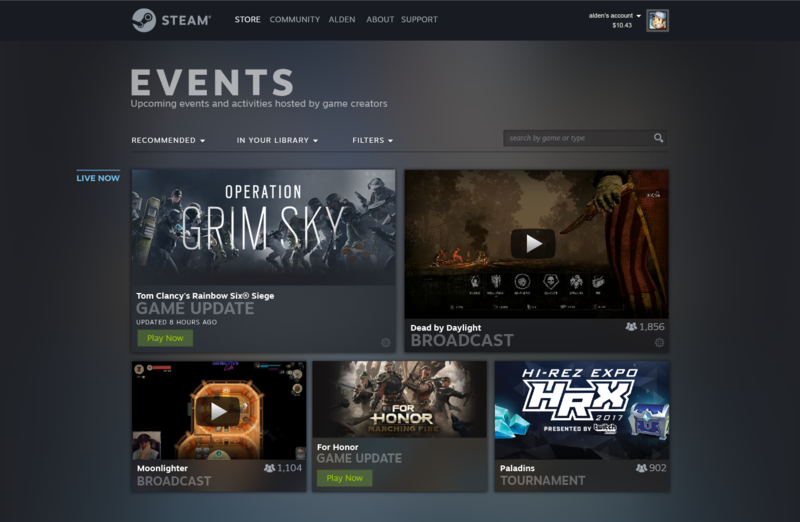 Previously Steam operated over the open internet, which created a host of problems during global streaming events, effectively crippling online play and content delivery. However, by allowing developers access to the network, Valve reports the best possible stability across both peer-to-peer and dedicated server hosting. Additionally, this is available to non-Steam games as an open source download through GitHub. "What we're able to do is prioritise that latency-sensitive game traffic and also protect player and server IPs to avoid DDoS attacks," said Gerber. "This network is truly built for gamers and game developers and it's vastly better than the open internet." Valve remained quiet on the curation issue, instead offering a few tools to help established developers connect with their audience. The new Events system is designed to keep developers tied into their communities, but as a discoverability tool it does little to help new games or developers. The Events system aims to keep players abreast of major updates, developer AMAs, and live streams. This feature will also include full calendar integration and gives developers an opportunity to put their existing game in front of consumers again.. Steam is also rolling out more data and traffic reporting on where games are showing up in the store, community, and friend lists. The platform recently added traffic stats for devs to tell how many potential customers are seeing their game along with levels of engagement. This all ties in with the recently launched developer pages which serve as a means of keeping players updated about new games from their preferred studios. Alden Kroll from Steam's design team said the pages "help developers build those long-term relationships with their fans over time." Steam has also introduced livestreams directly on to the store page. Devs will be able to stream the game themselves, or have someone from their community stream in their place. The issue of review bombs was also addressed. Steam recently changed the way it calculates user reviews on the platform, and by default currently excludes off-topic review bombs. Using an algorithm, Steam is able to detect a large volume of reviews, and then manually make judgement calls as to whether they are "off topic." Additionally, it has introduced a Help button for developers if their game is under attack. "We wanted to make sure there was a button in case there was something we missed, or our algorithm is not catching," said Kroll. "So the developer can always ask for help, which means our moderation teams can jump in and help them moderate their reviews and forums. "As a business team, we'll be able to reach out to the developer and [offer our experience]... We want to make sure that is accessible to the developer and that they are welcome to contact us any time." Finally, there was an emphasis on the work Valve has done to facilitate non-conventional payment options in emerging markets. According to Ricky Uy from the business development team, in Asia only 12.5% of transactions go through the traditional Western payment methods such as Visa, PayPal, and MasterCard. While Uy claimed non-conventional methods cost Valve more money to process and facilitate, it's an additional fee the company eats so developers don't have to. On top of that, Valve revealed it has five support centres around the world, operating in 21 different languages, with over 1,000 agents.